Slot machine mechanism seems to be very simple at first sight. However, not everyone knows that slot machine mechanism is pretty sophisticated stuff to deal with. The main components of every slot machine mechanism are known to be the reels of slots and random number generator being the heart of the slots. All slot machines dispose reels to display the spinning slot symbols and determine the spin outcome. 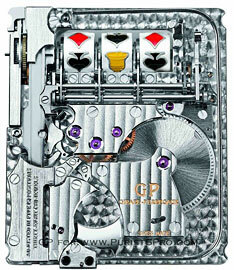 The slot machines can be 3 reel, 5 reel, 7 reel, etc. Until the video slots emergence, all slots had physical reels. The problem with the 3 reel slot machines, for instance is the4 fact that the number of possible combinations can be only cubic. Thus, the first slot machine in the slots history invented by Charles Fey had 3 reels with 10 images depicted on each reel. Hence, there were only 1000 possible symbol combinations. That fact limited the jackpot amounts and prompted them to add some more reels in further slot machine modifications. With the development of computerization era, microprocessors became the brains of the slot machines in the form of the so called random number generators. Random number generator is known to be inbuilt into the slot machine the microchip that is said to generate the random numbers constantly, even if the slots are standing idle. All those random numbers are generated in compliance with each reel position. Thus, while playing the gamer cannot initiate anything, except the reels spinning. The matter is that the abovementioned specific microprocessor inbuilt into the slot machine is somehow similar to that one that is known to be widely used in personal user's computers. However, instead of running, for example, Word program, it is designed to run the program for slots called Random number generator. It is constructed to generate the random numbers in correspondence to the reels symbols matched. It is essential to know that it generates the numbers constantly, as long the machine is powered. It is also essential to keep in mind that gamers that are sure they know how to beat the slots are mistaken. The point is that RNG makes slots the game of pure luck and some particular skills may be scarcely applied in slots gambling, indeed. You can pick from hundreds of online slots for real money games at the major online casino sites. You can even play slots games with progressive jackpots, which grow every time someone plays the game and doesn't win. Some of the biggest payouts in the online casino come from slots with progressive jackpots.